Amethyst is a quartz crystal that appears in various tones from pale pink-lavender to intense royal purple. It is a gemstone displaying pleochroism, meaning additional tones of red and blue can show depending on the direction light strikes the gem. In Greek mythology, the god of wine and revelry, Dionysus, murdered a maiden named Amethyst while in a drunken rage. With her dying breath the girl prayed to Artemis for protection. The goddess transformed her into a white quartz statue. When Dionysus realized what he had done, he wept into his wine goblet and collapsed at the foot of the statue, spilling the goblet’s contents on the statue. The crystal figure of Amethyst became stained with tears and wine. 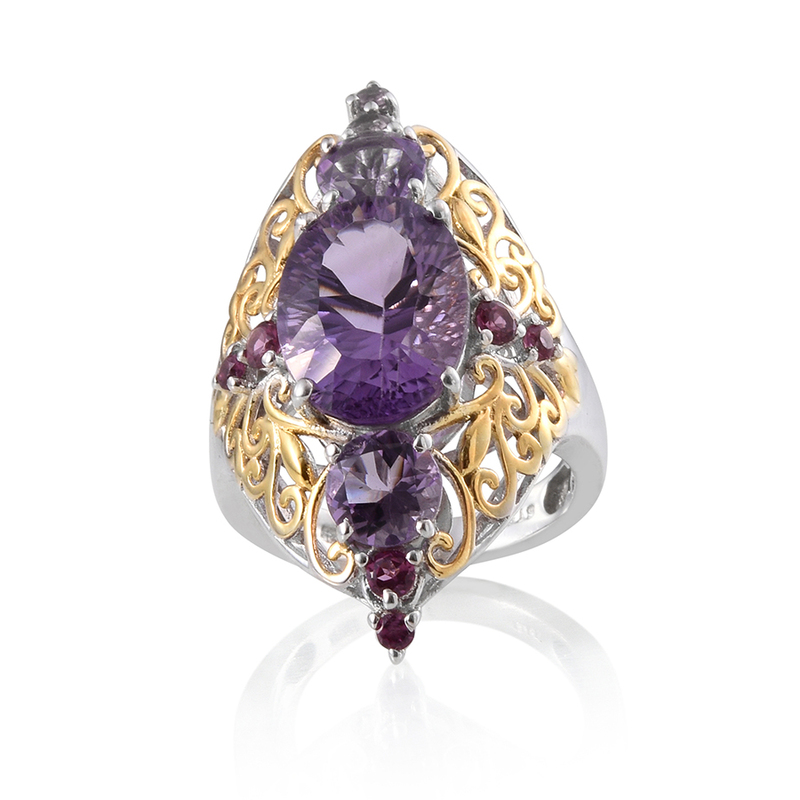 From this mythological tale the gem amethyst has become a symbol of sobriety. Ancient wine chalices were sometimes carved from amethyst in an attempt to stop heavy drinking. Is Bahia amethyst valuable? The value of colored stones is typically determined by a combination of its color, clarity, cut, and carat weight. This is no different when determining what amethyst is worth. These guidelines will help you choose amethyst stones for your collection. Amethyst owes its color to iron and aluminum impurities. The colors range from purple and violet to pale red-violet – the color palette characteristic of Bahia amethyst. Bahia amethyst features a lighter violet tone that’s often reddish and smoky in appearance. Dealers prefer an intense reddish purple to purple color making this gem very desirable. Although constrained to one locality, an abundant supply of Bahia amethyst results in gems usually clean and free of flaws or inclusions. Amethysts with eye-visible inclusions but attractive color are usually shaped into cabochons or beads. Bahia amethyst is available in just about every shape, cut and size. 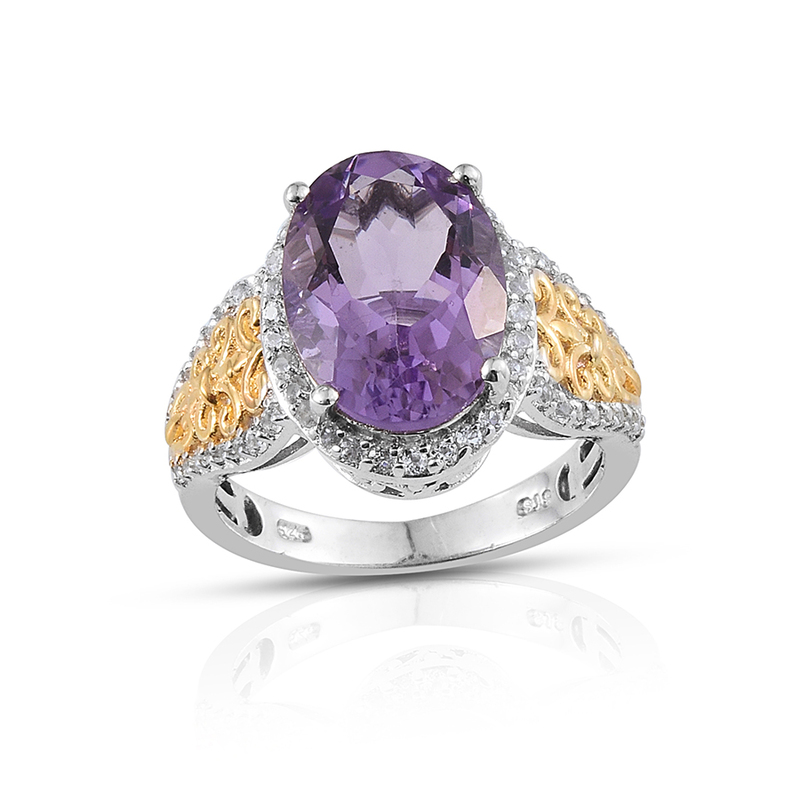 Expect to find this lovely purple gem in popular shapes like rounds, ovals and pears, carefully hand-cut to perfection. Bahia amethyst, like other varieties of amethyst is available in all size ranges. The gem is often set as a large center stone since the price per carat does not rise dramatically with larger size. Most amethyst requires no additional treatment. Occasionally, Bahia amethyst undergoes heat treatment. This process improves the color of the stone. A very stable treatment, it requires no special care. With a Mohs hardness ranking of seven, Bahia amethyst stone withstands abrasions and scratches with ease, so it is suitable for all jewelry types. Be it rings, bracelets or earrings, the gemstone allows you flaunt an elegant sparkle every time. This gemstone simply requires standard care. Use warm, soapy water and a soft bristled brush to scrub the stone clean. Rinse with cool, clean water and dry with a soft towel. Ultrasonic cleaners are usually safe for amethyst, but avoid sonic cleaners as they can damage the stone. Avoid sudden changes in temperature, as that can fracture stone. Prolonged exposure to light may cause some amethyst to fade. Avoid exposure to abrasive chemicals, with can cause etching in the stone, or discoloration. Store Bahia amethyst in a fabric lined jewelry box. This will help preserve your stone for years of enjoyment. Who Can Wear Bahia Amethyst? If you are a fan of purple gems then Bahia amethyst is an amazing choice. 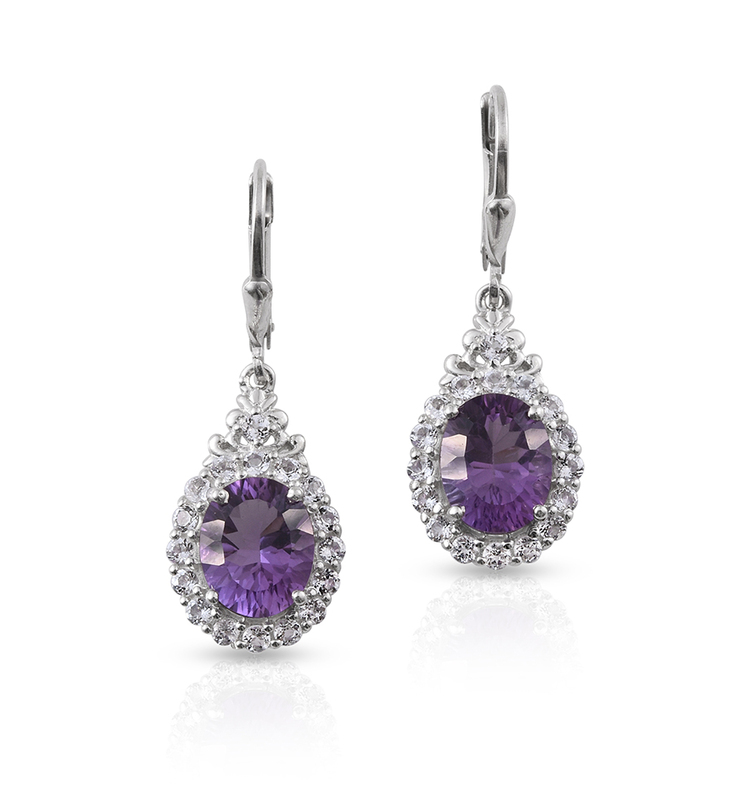 The subtle purple of this gem makes your jewelry apt for both day or evening occasions by adding a romantic sparkle. With purples trending across the fashion industry, Bahia amethyst jewelry is sure to keep you looking chic at any social gathering. How Does Bahia Amethyst Compare to Other Amethyst Stones? When you compare Bahia amethyst to other amethyst stones, the main difference you’ll see is color. With varieties like Lusaka, Uruguayan and Moroccan amethyst displaying intense saturated violet purples, and Rose de France featuring light lavenders and lilac hues, Bahia amethyst offers a moderate purple with reddish tones. Where Does Bahia Amethyst Come From? Of all South American countries producing gem quality amethyst, the material from Uruguay and Bahia, Brazil is considered the best quality and most valuable. 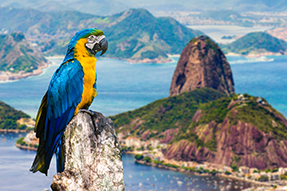 Bahia is ranked third within Brazil for its gem and mineral production. Due to exacting standards for quality, only 5-15% of mined Bahian rough is suitable for gem cutting. How is Bahia Amethyst Mined? Amethyst mined in Brazil is most often found in large deposits of geodes underneath the earth by workers who tunnel along veins of the rough gemstone to discover them. Once located these areas are then hollowed out - often by hand or by mechanical processes. The undesirable portions of rough are removed through a process known as "cobbing". Small hammers are used to knock off the unwanted pieces attached to the rough gemstone. Cobbing is frequently performed onsite before the gem is sent for cutting. What Does Bahia Amethyst Mean? In Greece archeological evidence of polished amethyst set in gold rings has been found dating back to the Minoan period (around 2500 BCE). Leonardo Da Vinci believed amethyst could dispel malice and hasten sound thinking. Also, people thought it was beneficial against money and legal troubles and helped develop business acumen. Amethyst is a protective stone helpful for travelers and military families. It has been used by crystal healers to help with addiction, insomnia, pain relief, immune deficiencies, circulatory issues, reproductive health, and general healing. Is Bahia Amethyst a Birthstone? Amethyst is the modern birthstone for February. Bahia amethyst with just the right amounts of purple and reddish, smoky hints makes for a fascinating addition to the amethyst family. 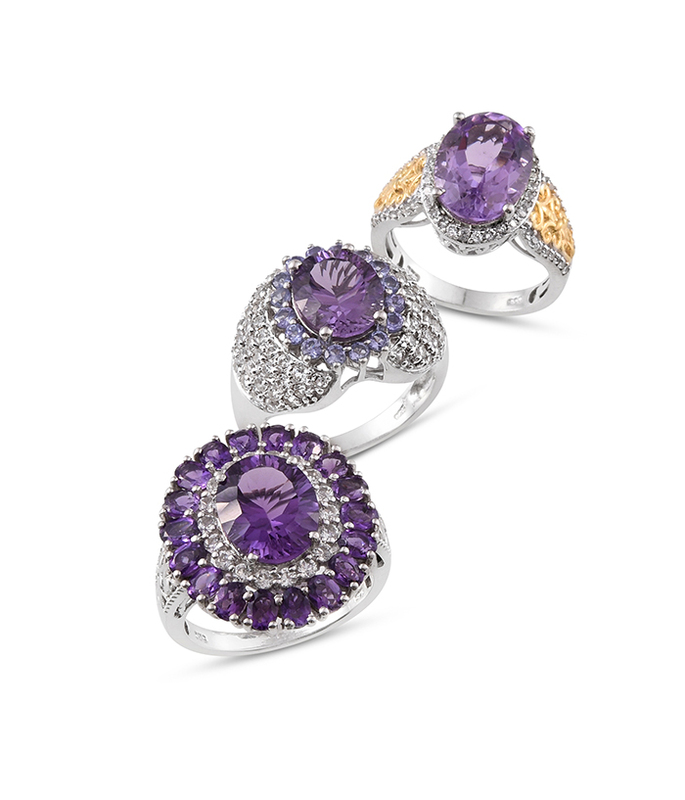 Bahia amethyst jewelry serves as amazing birthstone gifts. Amethyst ranks seven on the Mohs scale. Bahian amethyst displays a medium purple tone, with a red and smoky undertone. This variety of amethyst comes from Bahia, Brazil. Occasionally, Bahian amethyst undergoes heat treatment to improve color.